4 Lug Wheel Adapters. 4 To 5 Lug. 5 Lug Wheel Adapters. 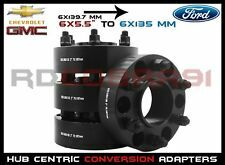 These Conversion Adapters allow you to mount 6x135 MM wheels on a Chevy/Gmc/Cadillac 6x5.5" (6x139.7 mm) Truck/Suv. 5 To 6 Lug. 6 Lug Wheel Adapters. 08-16 Cadillac CTS / 13-15 Cadillac XTS. 2013-2015 CADILLAC XTS 2wd 4wd 5-lug. 2PC SET of 20mm HUB CENTRIC WHEEL SPACERs. Our Pro-Billet Series Wheel Spacers are CNC machined from solid blocks of T6 Aircraft Billet and receive a special anodized coating. 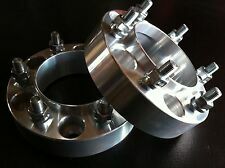 2 Hub CentricWheel Spacers 2" Thick 6x5.5 to 6x5.5 Lug 14mm x 1.5 Studs. These are machined to fit around your factory Chevy hub and factory wheel. These are not a generic one size fits all product. 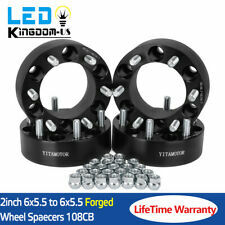 2 1.25" Hubcentric 5x4.75 to 5x4.75 Wheel Spacers 70.5mm M12x1.5 Studs. 1979-1985 Buick Riviera. Wheel spacers widen your vehicle wheel base, increasing stability;. ALL Lug Nuts (on the spacers and the wheels) MUST be torqued to manufacture specifications. (Thread Type 14X1.5. Bolt Pattern 6x5.5/6x139.7 TO 5x5/5x127. For CHEVROLET. 1) 2 Pcs Wheel Adapters. 2) 10 Pcs Plated Open Ended Steel Lug Nuts. - Check compatibility of spacer-to-hub, spacer-to-wheel, and lug nuts (thread pitch & seat type). CNC Machined Hubcentric Wheel Spacers without Lip. Features a hubcentric design that allows the spacer to fit perfectly around your vehicle's hub. Perfectly Hubcentric. These Wheel Spacers are designed to fit perfectly over your wheel hub. Make sure you get 6-8 FULL TURNS of the lug nuts before tightening. Check and re-torque all lug nuts after 50-100 miles of driving. 14X1.5 Studs. • CNC machined with 60 degree taper to precise specifications ,heat treated and hardened heavy duty spacers and studs for safety. Wheel Bolt Pattern. •Widen your vehicle’s wheel base, increasing overall stability and providing you with better handling. 4 1.25" Hubcentric Wheel Spacers 5x4.75 to 5x4.75 M12x1.5 Stud for Buick Riviera. Make sure you get 6-8 FULL TURNS of the lug nuts before tightening. Check and re-torque all lug nuts after 50-100 miles of driving. Lifetime Warranty！Heavy Duty! Expedited Shipping! TRUST & SUPPORT USA SELLERS, NOT CHINA! HEAVY DUTY USA! Hubcentric Wheel Spacers with Wheel Centering Lip. Thread Size of Studs/Nuts 14x1.5. Bolt Pattern 5x120. Spacer Thickness 1.0" (25mm). High Quality Aluminum Wheel Spacers. They must make sure it will not push their wheels or tires out too far as to cause it to hit their fender or any other part of their vehicle. These Conversion Adapters allow you to mount 6x135 MM wheels on a Chevy/Gmc/Cadillac 6x5.5" (6x139.7 mm) Truck/Suv. 6x5.5" (6x139.7 MM). Porsche Hub Centric Wheel Spacers. Audi Hub Centric Wheel Spacers. (Thread Type 14x1.5. Bolt Pattern 6x139.7mm / 6X5.5". 1) 2 Pcs Wheel Spacers. If the studs are longer than 1.5" (38mm), it will extend past the spacer's surface. It may not be possible to bolt the wheel safely onto the spacer, depending on whether your wheels have pockets/cavities around the mounting pad. 5x4.75 To 5x4.75. - Easy for installation, simply bolt the wheel spacer to your hub, then bolt your wheel to the spacer. Wheel Bolt Pattern: 5x4.75/ 120.7. Vehicle Bolt Pattern: 5x4.75/ 120.7. - These wheel spacers will widen your vehicle wheel base, increasing stability and resistance to side roll-over. Fits 2009 & Newer Camaro Models Hub & Wheel Centric! Universal VS Hubcentric with Lip Hubcentric spacers are designed to fit snugly over your vehicle's center hub, allowing your wheel/tire to center properly, preventing vibrations and premature wear of wheel/tire components. SET OF FOUR ( 4 ) SPACERS. HUB & WHEEL CENTRIC 78.1 TO 78.1 (See the flange wheel-side for better fit, smoother ride!). Also information on what you are putting on wheel-side. 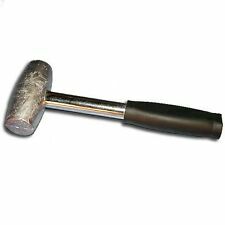 ( 24 ) Twenty-four 14MMX1.5 Lug Nuts for installation. These high quality billet wheel adapters help you space out your wheels, gaining extra clearance and a wider stance. When you lifted your vehicle or tried to install bigger size wheels and tires, you may get hitting problems. 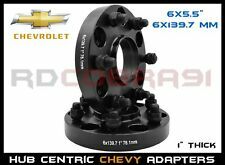 6x5.5 To 8x170 Wheel Adapters 14x1.5 For Chevy GMC Sierra 1500 Yukon Silverado. WHEEL BOLT PATTERN: 8X170 ( ALSO KNOWN AS 8X6.7). VEHICLE BOLT PATTERN: 6X5.5 (ALSO KNOWN AS 6X139.7). - 24X 14x1.5 OPEN ENDED LUG NUTS TO INSTALL ADAPTERS TO HUB OF YOUR TRUCK. Stud/Nut Thread Size 12x1.5. Allows your vehicle to use 5x114.3 or 5x4.5 Bolt Pattern Wheels. Wheel Bolt Pattern 5x114.3 or 5x4.5. 5x110 5x114.3 1.0" Silver 380975447171. Vehicle Bolt Pattern 5x110. 5x110 5x4.75" 1.0" Silver 281461016581. Black Hub-Centric Wheel Adapters. 4 Lug Wheel Adapters. 5 Lug Wheel Adapters. These Conversion Adapters allow you to mount 6x135 MM wheels on a Chevy/Gmc/Cadillac 6x5.5" (6x139.7 mm) Truck/Suv. 6 Lug Wheel Adapters. BOLT PATTERN: 6X5.5 TO 6X5.5 ALSO KNOW AS 6X139.7 TO 6X139.7 (ASK IF UNSURE). As soon as a spacer is mounted we consider it used. Complete Wheel Spacer Kit. 1 WHEEL SPACER WITH ALL HARDWARE NEEDED FOR INSTALL. ▶TRUST USA QUALITY NOT CHINA!◀ + LIFETIME WARRANTY!!!!! STUD THREAD SIZE: 14X1.5. WHEEL BOLT PATTERN: 6X135. VEHICLE BOLT PATTERN: 6X5.5 (ALSO KNOW AS 6X139.7). -COMPLETE KIT OF 4 WHEEL ADAPTERS ALL HARDWARE NEEDED FOR INSTALL. Complete Wheel Spacer Kit. Stud/Nut Thread Size 12x1.5. Vehicle Bolt Pattern 5x5" (5x127). Allows your vehicle to use 5x4.5" (5x114.3) Bolt Pattern Wheels. Wheel Bolt Pattern 5x4.5" (5x114.3). CNC Machined Aluminum Wheel Adapter Spacers. 6x5.5" (6x139.7 MM). Audi Hub Centric Wheel Spacers. Bmw Hub Centric Wheel Spacers. Porsche Hub Centric Wheel Spacers. Black Hub-Centric Wheel Adapters. WHEEL ACCESSORIES. 4 Lug Wheel Adapters. 5 Lug Wheel Adapters. Thread Size: M14x1.5. 6x5.5 To 6x5.5. Wheel Bolt Pattern: 6x5.5 / 139.7. Vehicle Bolt Pattern: 6x5.5 / 139.7. Vehicle Bolt Pattern Spacers Wheel Bolt Pattern. Black hub centric wheel spacers. - These wheel spacers will widen your vehicle wheel base, increasing stability and resistance to side roll-over. 20X 14X1.5 LUG NUTS TO MOUNT YOUR WHEELS TO THE SPACER STUDS! STUD THREAD SIZE: 14X1.5. BOLT PATTERN: 5X4.75 TO5X4.75 (ALSO KNOWN AS 5X120.7 TO 5X120.7). THICKNESS: 17MM. Whether you want to give your vehicle that aggressive stance, eliminate rubbing, mount a larger wheel or tire, clear breaks or struts, our spacers are perfect for all of the above! The wheel side bolt pattern is 5x120, it is not 5x120.7. Locking Lug Nuts. - One set of the appropriate lug nut style with the "adapter stud thread size" listed above to bolt the wheel to the adapter. 4 PC SET OF 6x139.7 MM (6x5.5") 1.25" BLACK HUB CENTRIC WHEEL ADAPTERS(1999-2016) CHEVY SILVERADO 1500 TAHOE AVALANCHE & MORE(1999-2016) GMC SIERRA 1500 YUKON & MOREVEHICLE BOLT PATTERN SAME BOLT PATTERN WHEEL BOLT PATTERN6x139.7 MM (6x5.5") 6x139.7 MM (6x5.5")  Brand New Black Full Hub Centric Wheel Centric Chevy/GMC/Cadillac 6x139.7 MM (6x5.5") 1.25" Thick Wheel Adapters Hub Centric Adapters= No vibration/wheel wobble at high speeds. Perfect adapter for your Truck/SUV's Adapters are designed to move the wheel further out from the hub. Fixes clearence issues, wheel hitting the brake calipers or shock/struts. Fixes wheels that look tucked in the fenders, Gives your car an aggressive st.
6x5.5 To 6x5.5. Wheel Bolt Pattern: 6x5.5" / 6x139.7. Vehicle Bolt Pattern: 6x5.5" / 6x139.7. Vehicle Bolt Pattern Spacers Wheel Bolt Pattern. - These wheel spacers will widen your vehicle wheel base, increasing stability and resistance to side roll-over. Fits 5x4.50 / 5x4.75 / 5x5 Bolt Circle. (4) New universal 5 lug bolt circles. Will these adapters fit my vehicle?. Will these adapters fit my wheels?. International Orders Important notes . Thread Size of Studs/Nuts 14x1.5. Universal Wheel Spacers - 6x139.7 / 6x5.5" Bolt Pattern. Vehicle Bolt Pattern 6x139.7 / 6x5.5". Wheel Bolt Pattern 6x139.7 / 6x5.5". High Quality Aluminum Wheel Spacers. Thread Size：12x1.5 Studs. CNC machined with 60 degree taper to precise specifications, heat treated and hardened heavy duty spacers and studs for safety. 4 Pcs Wheel Spacers Adapters. Widen your vehicle’s wheel base, increasing overall stability and providing you with better handling. 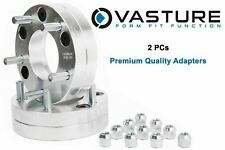 4 PCs 1.5 " 6x120 HUB Centric Wheel Spacer/Adapters, 66.9 mm Center Bore. Fit Chevrolet: Colorado, Canyon, GMC: Acadia. 🔹 Your vehicle studs may have different thread than what is supplied with the spacers. 6x5.5 To 6x5.5. Wheel Bolt Pattern: 6x5.5 / 139.7. Vehicle Bolt Pattern: 6x5.5 / 139.7. Vehicle Bolt Pattern Spacers Wheel Bolt Pattern. Black hub centric wheel spacers. - These wheel spacers will widen your vehicle wheel base, increasing stability and resistance to side roll-over. Thickness: 0.75" (20mm). These high quality billet wheel adapters help you space out your wheels, gaining extra clearance and a wider stance. When you lifted your vehicle or tried to install bigger size wheels and tires, you may get hitting problems. 1.5" Hub Centric Wheel Spacers. GMC, Escalade. (4 Heavy Duty Wheel Spacers). Our 1.5" wheel spacers are made from ultra-strong 6061 Billet Aluminum. Our premium quality spacers are made to ensure years of strength & durability. 1 pcs Installation Manual Instruction. Wheel spacers widen your vehicle wheel base, increasing stability;. ALL Lug Nuts (on the spacers and the wheels) MUST be torqued to manufacture specifications. Hardened CR-Steel Studs;. 6x5.5 To 6x5.5. Vehicle Bolt Pattern Spacers Wheel Bolt Pattern. - These wheel spacers will widen your vehicle wheel base, increasing stability and resistance to side roll-over. Ensure these spacers are the correct ones for your vehicle, right bolt pattern, right threads size, right center bo re. Audi Hub Centric Wheel Spacers. Bmw Hub Centric Wheel Spacers. 6x5.5" (6x139.7 MM). Porsche Hub Centric Wheel Spacers. BLACK HUB CENTRIC WHEEL ADAPTERS. Hub Centric Adapters= No vibration/wheel wobble at high speeds. 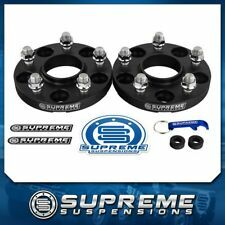 2Pcs 1" Wheel Spacers 5x4.5 For Ford Mustang Explorer Lincoln Mercury Jeep 1/2"